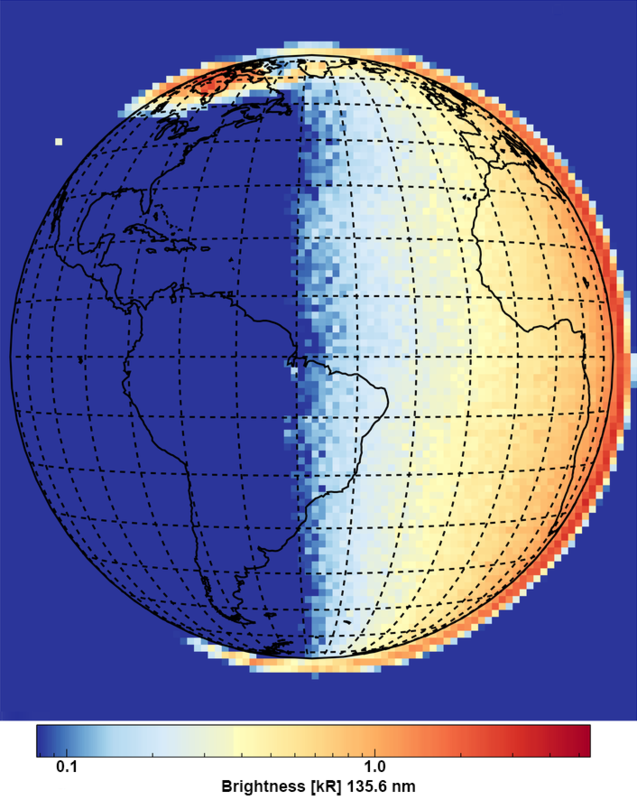 September 19, 2018 – The GOLD instrument powered on and opened its cover to scan the Earth for the first time, resulting in a “first light” image of the Western Hemisphere in the ultraviolet. GOLD will provide unprecedented global-scale imaging of the temperature and composition at the dynamic boundary between Earth’s atmosphere and space. The instrument was launched from Kourou, French Guiana, on January 25, 2018, onboard the SES-14 satellite and reached geostationary orbit in June 2018. After checkout of the satellite and communications payload, GOLD commissioning -— the period during which the instrument performance is assessed -— began on September 4. Team scientists conducted one day of observations on September 11, during instrument checkout, enabling them to produce GOLD’s “first light” image shown here. Commissioning will run through early October, as the team continues to prepare the instrument for its planned two-year science mission. Built by the University of Colorado Boulder’s Laboratory for Atmospheric and Space Physics, and managed by NASA’s Goddard Space Flight Center in Greenbelt, Maryland, GOLD is the first NASA science mission to fly an instrument as a hosted payload on a commercial satellite. Data from the instrument -— comprised of two, identical ultraviolet-imaging spectrographs -— will improve our understanding of the Sun’s impact on the Earth’s upper atmosphere, as well as the effects from terrestrial weather below. Along with NASA’s Ionospheric Connection Explorer, or ICON, scheduled for launch later this fall, GOLD is a key element of NASA’s program to explore Earth’s boundary with space, as the two missions explore this unpredictable near-Earth region to determine how it responds to solar and atmospheric inputs. Changes in near-Earth space can affect our lives on Earth by disrupting the use of satellites for communications and navigation. The result can be lost messages, aircraft flight delays, interruptions in GPS signals, and satellite TV outages. Incoming solar energy can also damage spacecraft electronics and detectors, and expose astronauts to health risks from radiation. The more we understand about the fundamental nature of our space environment, the better we can protect these interests. Scientists expect to begin operations of the GOLD instrument in early October 2018.